On August 29th, 2018 Santa Clara County Park's (CA) Natural Resource Coordinator Kyle and I installed a pulley system on a Barn Owl nest box mounted on a 2" diameter metal pipe. The system enables the raising and lowering of similarly mounted large nest boxes from the ground thereby negating the need to lug a ladder to the nest box in order to access it. A lock is used to secure the box in its raised position. Although a Barn owl nest box is shown, the system will work with a similarly mounted kestel nest box. The attached photos provide some insight into the make-up of the system. Great Idea, but you could add a small winch on the bottom to crank up the nest box. Accessing large nest boxes is a problem of varying magnitude. Merely getting to the box with a ladder and servicing supplies can be difficult unless they can be carried on a vehicle. Due to habitat restrictions, some of my large nest boxes require carrying the ladder and supplies to the box by hand. This is usually done once a year when the box is serviced after the end of the nesting season. Additional access may be required for the purposes of banding or to intervene in a problem. This begs the question “is there an easier way to access the nest box”? To address the question, I developed a pulley system to easily access a nest box mounted on a 2” ID galvanized metal pipe (pole). 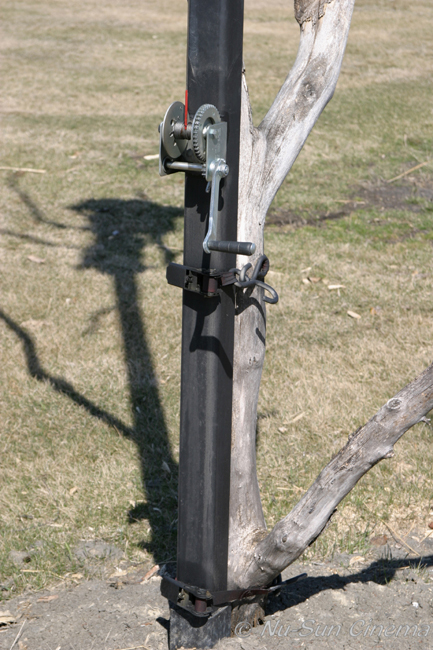 Specifically, the system enables the raising and lowering of a large pole-mounted nest box from the ground thereby negating the need to port a ladder to the box. A lock secures the box in its raised position. The pulley system is most beneficial when used with boxes that are remote and accessible only by foot. Posted in General Discussion by Lee Pauser 7 months 3 weeks ago.